But the cultural boycott campaign against Israel has had mixed success. 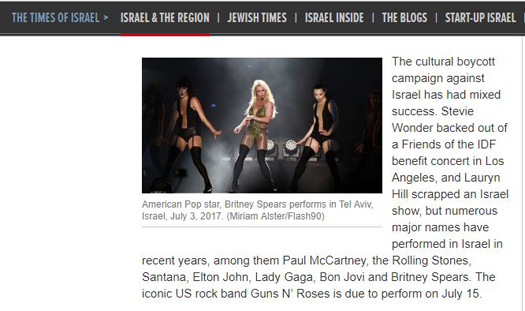 Stevie Wonder, Carlos Santana and Lauryn Hill have scrapped shows, but Santana then played in Israel last summer and plenty of other major names have performed in recent years, among them Paul McCartney, the Rolling Stones, Elton John, Lady Gaga, Bon Jovi and Britney Spears. The iconic US rock band Guns N’ Roses is due to perform on July 15. For additional Times of Israel clarifications and corrections prompted by CAMERA, please see here.